Under American criminal law, defendants are innocent until they are proven guilty. You have probably heard this phrase many times before; most people are familiar with the general concept. In a criminal court, the prosecution has the legal burden of presenting evidence to prove the defendant’s guilt beyond a reasonable doubt. This is one of the core foundations of our criminal justice system. Unfortunately, in reality, the presumption of innocence may not be as strong as would we like to believe. A recent study confirmed what most Miami criminal defense lawyers would have already told you: many jurors believe that a person is guilty, simply on the basis that they were charged with a crime in the first place. Earlier this month, the New York Law Journal reported on a study that was conducted on more than 1,200 jury eligible people. The purpose of the study was to get information regarding the views and attitudes that these people had toward criminal defendants. To be clear, the study was surveying beliefs about criminal defendants, meaning people who have been charged with a crime by state or federal prosecutors. These people are not necessarily criminals. However, unfortunately, as this study demonstrates well, the two terms are often conflated in the minds of many people. 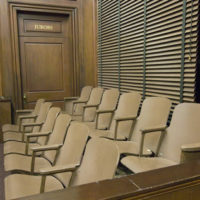 While all defendants are innocent until proven guilty in a court of law, most jurors do not enter the courtroom with that view in their mind. This is a subtle, but very important bias in the criminal justice system. Seventy-seven percent of those who were surveyed believed that a person who has been indicted is most likely guilty of the crime. The simple act of being charged carries an enormous stigma, even if no evidence has yet been presented by prosecutors. While jurors are instructed on the correct way to view a case when they serve in a trial, there is zero doubt that their initial bias will remain in many people. As a society, we need to do more to ensure that the public understands how the criminal justice system is supposed to operate. To function properly, a well-informed public is an important part of the process. If you have been charged with a crime, you should also understand the biases in the system. Even if you know that you are completely innocent, it is imperative that you work with an experienced Miami criminal defense lawyer who can help you present the strongest possible defense. At Ratzan & Faccidomo, LLC, our aggressive Miami criminal defense attorneys have the legal skills and tenacity to protect the rights of our clients. If you have been charged with a crime, please do not delay: contact us today at 305-600-3519. From our office in Miami, we represent defendants throughout the region, including in Miami Beach, Opa Locka, Hialeah, and Biscayne Bay.